If you’ve read many of my posts, you’ll realize that I love making things for Mordheim that I will never need to remake. That is the biggest reasons why I don’t put bases on terrain or buildings. I know that no matter what board I make later, my buildings will fit on it gorgeously! Yesterday, I read a post by Pathfinder Dubstyles about How to Magnatize Mordheim Miniatures to make swappable arms, weapons and even heads! 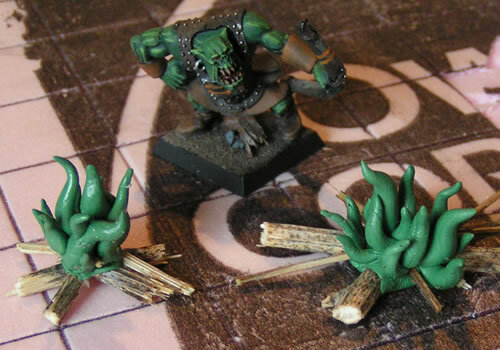 This way, you don’t have to make another whole miniature when you buy him a new weapon! Pathfinder Dubstyles has created an amazing tutorial, and I hope to follow it very soon. I have just under a month left in the 1-inch base competition, and I’ve finally put aside a small amount of time for my entry. (I was extremely busy last month… right guys…?) First, the pictures, then I’ll explain what my entry is for. 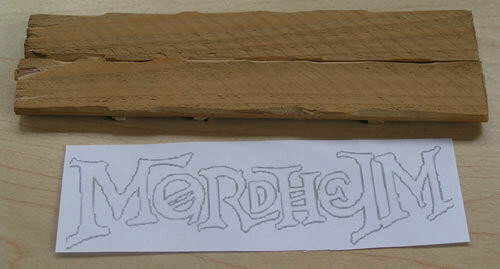 Now that I created the Mordheim Sign, I need posts to put it on. I decided to have these posts be part of my Modular Fence. So the first step of my Mordheim Entrance is to create a Mordheim Sign to welcome visitors to the City of the Damned. I have been building my latest Mordheim terrain project for the Companion Piece Competition at Terragenesis.co.uk. (That link will direct you to the completed entries for this competition.) I am proud to announce that I just barely stole 1st place with my Mordheim Terrain Platform! I have now completed my second Mordheim Terrain Platform/Elevation! I’ve been doing more work on my Mordheim terrain entry for the Terrain competition at Terragenesis. I’ve had “terrainer’s block” for the last couple days, as I haven’t been able to create the tops of the short pillars to my liking. I still don’t really know what I’m going to do. My Green Stuff apparently has aired out a lot, and is very hard to work with. Fire is really hard to make.